If you’re in the Mechanicsburg area on August 20 please stop by my book signing on the second floor Art Gallery at Sunbury Press from 6:00-9:00! One of the things that inspired the depiction of some of the images in From Blue Ground was the early photography from the mid to late-nineteenth century. I had a professor in college who had quite a collection of period civil war photos, many of them glass plate negatives and stereo photographs. I recall that they were both revealing and haunting because of the clarity and depth of the photographic process of the time. Although it’s a relatively easy Google search, below you’ll find some of the research I used and the photographs that inspired some of the depictions in the book. Many individuals typically think of “photographs” as plastic-based negatives and slides; but these photographic techniques are relatively recent inventions. Prior to the invention of cellulose nitrate film in 1903, photographic emulsions were made on glass supports. These glass supports are typically referred to as glass plate negatives. The term “glass plate negative” refers to two separate formats: the collodion wet plate negative and the gelatin dry plate. Both of these formats consist of a light-sensitive emulsion that is fixed to the glass plate base with a binder (Greta Bahnemann, 21 March 2012) (read more here). Collodion Wet Plate Negatives were in use from 1851 until the 1880s. They were invented by Frederick Scoff Archer, an English sculptor, who using a viscous solution of collodion, coated glass with light-sensitive silver salts. Because it was glass and not paper, wet glass plates created a sharper, more stable and detailed negative. Furthermore, a photographer could produce several prints from one negative. A Collodion wet plate negative can usually be identified by an unevenly coated emulsion, thick glass, rough edges, and sometimes a photographer’s thumb print on the edge. Silver Gelatine Dry Plate Negatives were invented by Dr. Richard L. Maddox and first became available in 1873. They were the first economically successful durable photographic medium. Unlike the wet plate variety gelatine dry plates were more easily transported, usable when dry, and needed less exposure to light than the wet plates. Other distinguishing features between the wet and dry variety were the thinner glass and a more evenly coated emulsion in the dry plate negative form. Dry plate glass negatives were in common use between the 1880s and the late 1920s (From Somerset Photography, 2009) (read more here). The 1876 Philadelphia Centennial Exposition, the first exposition of its kind in the United States, was held to mark the 100th anniversary of the Declaration of Independence. It celebrated not only a hundred years of American independence, but also the country’s recovery from Reconstruction and its emergence as an internationally important industrial power. Ten years in the planning, the Centennial Exposition cost more than eleven million dollars and covered more than 450 acres of Philadelphia’s Fairmount Park. More than ten million visitors visited the works of 30,000 exhibitors during its six month run. The focal point of the exposition was Machinery Hall, where visitors could marvel at the engineering wonders of the age: electric lights and elevators powered by the 1,400-horsepower Corliss steam engine, locomotives, fire trucks, printing presses, mining equipment, and magic lanterns. Introduced to the public for the first time were typewriters, a mechanical calculator, Bell’s telephone, and Edison’s telegraph. These and thousands of other artifacts became the basic collection of the new Arts and Industry Building of the Smithsonian Institution. The other major attractions were the Main Building, devoted to manufactures of the U.S. and other countries; Memorial Hall, dedicated to the fine arts; and Horticulture Hall, a conservatory for the display of native and exotic plants. Everything at the Centennial was classified by department (Mining and Metallurgy, Manufactures, Education and Science, Art, Machinery, Agriculture, and Horticulture), and further in a logical scheme that later became a model for the Dewey Decimal System. The greatest impact of the Centennial Exposition was on the image of the United States. Before 1876 Europe had generally considered the U.S. an upstart country, not yet quite eligible to join the ranks of first-class nations. In this country, Americans had come through a difficult period; the post Civil War years were marked by political scandal and lack of leadership. Visitors and businessmen from abroad were astonished at America’s industrial productivity, its creativity, and its progressiveness. The country was hailed as the land of progress and increasing economic power. The Centennial gave Americans pride in the present and confidence in an even greater future. The Centennial was an opportunity for the United States to highlight its industrial and agricultural products. The Country was just beginning to look towards a global economic presence. Representatives from other nations who came to display their own products also had an opportunity to see what they might purchase from American firms. Various states also were represented at the fair. Delaware, for example, emphasized its potential for economic development by describing its towns, transportation, and educational facilities. People say there is no rest at Wiggans Patch, where time hasn’t healed. The wild story of what happened there and the injustice that followed might be shrugged off by some as simply unbelievable, except for the fact that it’s true. 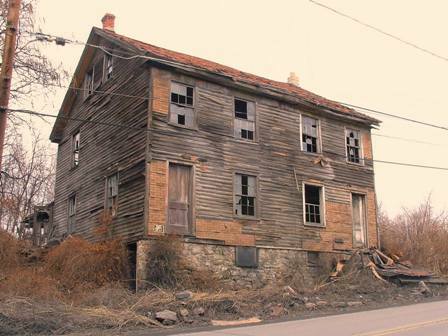 Said to be Schuylkill County’s most haunted site, Wiggans Patch continues to feel reverberations even after 134 years. Time hasn’t erased images of the horrific bloodshed in the middle of the winter night. It was the evening of Dec. 9, 1875. Ellen O’Donnell McAllister lived at 140 Main Street in Wiggans Patch, now called Boston Run, about 14 miles northeast of Tamaqua. She was 20 and pregnant. Ellen and husband Charles stayed with Ellen’s mother in the large wood-frame duplex situated atop the knoll just beyond Mahanoy City. Also living there were Ellen’s two brothers, one named Charles, the same as Ellen’s husband. Life was tough for the hardworking family. Money was scarce. Worse yet, it was a time of labor unrest and turmoil in northeastern Pennsylvania, a situation that impacted the O’Donnell family. The O’Donnells were suspected of being members of the reputed Molly Maguires, a band of Irish immigrant coal miners accused in a string of murders and assaults throughout the southern coalfields. To be exact, Ellen’s brothers had been implicated in the September 1 killings of mine boss Thomas Sanger and miner William Uren at Raven Run. If that weren’t enough, some said Ellen’s brother-in-law, James McAllister, was an accomplice. There was an obvious connection linking the O’Donnells to the Mollies. Ellen’s sister, Mary Ann, was married to Black Jack” Kehoe, a Girardville innkeeper known as King of the Mollies. It was guilt by association. Nothing had been proven. But Ellen lived during a complicated period in American history. There had been countless murders in a reign of terror throughout eastern Pennsylvania’s coalfields. The public was worried and frenzied. Whether right or wrong, the strong links to the Mollies were enough to cast suspicion over the O’Donnell crew. To be a Molly was to be bad, according to what folks said and wrote back then. But there are two sides to every story. Today, some see things differently. Many say the Mollies, themselves, were wrongly accused. In many ways, they may have been victims of circumstance, targets of anti-Catholic prejudice. They might have been framed. Some say they might even be hailed as heroes today for advocating workers’ rights. These repressed laborers had fled Ireland’s potato famine to come to the land of opportunity. But instead of bettering their lot, they found themselves toiling deep in the bowels of dark, dank coal tunnels. Long hours of sweat produced little pay. There was no such thing as upward mobility except for each day’s vertical climb out of the dangerous black hole. Perhaps the Mollies rebelled, as many say. But if they did, maybe their antagonistic push for better working conditions was well intended. Perhaps their cause sparked the rise of America’s organized labor movement. But on this day, the only labor that concerned Ellen was the physical stress of her upcoming childbirth. Historical accounts clearly describe what happened on the cold December night. Ellen’s mother, Margaret, a widow, was the last to go upstairs to bed. Grannie,” as they called her, had just finished putting coal on the stove to keep the house warm. She knew that Ellen’s pregnancy was coming along fine. But naturally, Grannie didn’t want her daughter to catch a chill. All was peaceful for a few hours as the stroke of midnight changed December 9 into December 10. Then, about 1 a.m., Ellen was awakened by a strange noise, a very intense rustling and crunching. It sounded as if hordes of people were stomping on top layer of fallen leaves. Ellen nudged hubby Charles, asking him to investigate. Before anybody could react, a small army of about 20 armed, camouflaged men kicked in the door, roared into the house and began firing. Ellen’s brother Charles was dragged out of the house by the invaders. His body was riddled with 18 bullets. Her other brother escaped. James McAllister was found in the house, too. The vigilantes grabbed him and put a noose around his neck. But when they dragged him outside, James somehow managed to wiggle free and flee into the dark woods. Seeing what was happening at the front of the house, Ellen’s husband jumped out a back window and disappeared into the night, chased by a few of the gunmen. Grannie was pistol-whipped but still alive. By this time Ellen had put on her robe, made her way down the dark stairway to see what the ruckus was all about. She appeared at the front door to catch a glimpse of the goings-on. Several assailants turned, looked at her, and fired point blank. Ellen’s eyes rolled as she reached for her stomach with her right hand. With her left arm she tried in vain to deflect the siege of bullets. My baby,” she screamed. Oh dear God, my baby!” Ellen cried out, blood trickling from the corner of her mouth. She gasped, faltered, and clung to the doorframe for a few seconds. But her strength quickly faded and she crumpled to the floor. Seeing what they had done, the gunmen ran, scattering in all directions. The bitter air grew silent. Sweet Ellen McAllister, her precious unborn child and her brother had become three more victims of man’s inhumanity toward man. The news spread fast when, a few days later, Ellen’s body and that of her brother were taken to Tamaqua by train. Upon arrival, the corpses were packed in ice and stored overnight in the train station to await burial at old St. Jerome’s Cemetery. The massacre rocked the region. Police searched for the perpetrators. Theories abounded as to what really had happened. Some believed the ambush had been orchestrated by the Coal and Iron Police or even the Pinkerton Detective Agency. Some suggested a militia unit from Mahanoy City had done it. No arrests were made. Nobody ever was charged. For Ellen McAllister, her baby and her brother, there was no justice. And no eternal rest. In fact, many believe Ellen’s spirit roams Wiggans Patch. Energized by her strong will to live and give birth, she supposedly drifts through the site in her nightclothes. They say she waits for morning, for the eternal nightmare to end, so that she can give birth to her child in peace. Ellen’s due date was the day after she was murdered. The haunting can be felt at night. The pleas from the house are like a low moaning sensation as if she’s saying ‘help me, help my baby,'” said Deborah Randall, a Washington, D.C., playwright who investigated the murders several years ago while doing research on the Mollies. But the unrest doesn’t end there. On Nov. 17, 2006, the house long a spectacle and a destination for the curious was quietly torn down. Officials say the walls had begun to bulge. The house, which had been situated on land owned by the Reading Anthracite Company, had became lopsided, they said. It began to lean dangerously, threatening to topple onto the adjacent roadway and power lines. There was a drive mounted to preserve the structure but the building was torn down before the effort picked up steam. Then came another odd development. Last year, the site was nominated but then officially turned down to receive a state historical marker. It seems the state is having difficulty in identifying the relevance of the Massacre site and how it plays into the story of the Mollies. It seems there are forces that want to forget about what took place at Wiggans Patch. Some may try to discredit it, or wish it would go away. But the Wiggans Patch Massacre will remain a reality in the history of Pennsylvania, in the rise of organized labor, and in the saga of the Molly Maguires. But above all, it sadly remains a story without an ending. There was no justice. There were no trials. Nobody was ever caught and convicted. Today, it is still possible to see the cellar area and remnants of foundation walls at the site along Route 54. But nature is quickly reclaiming the land. Earlier this year, members of the Pennsylvania Paranormal Research Team, Schuylkill Haven, investigated the foundation area and declared it haunted. While researching, members say they were approached by the spirit of a little boy who asked to go along home with them. Who was the little boy? Was he the spirit of Ellen’s unborn child? Or was the voice actually that of Ellen herself? Some believe the shock of the murderous raid, an unbelievable horror, has trapped Ellen’s spirit at Wiggans Patch. She was an innocent housewife who didn’t deserve her fate. For her, time is standing still. They say she cries out each night for the bullets to stop. Ellen McAllister cries out for peace. 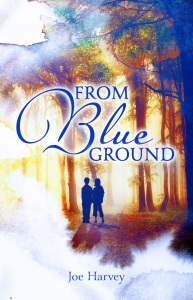 From Blue Ground is available for purchase at the retailers below! James McParland was not just a Pinkerton man. He was the living embodiment of Pinkerton’s National Detective Agency, the most famous sleuth in America’s first detective organization, the lawman who had smashed the Molly Maguires in the eastern coal fields and brought the Wild Bunch to justice in the West, a figure who inspired adulation and loathing in roughly equal measure. McParland was a showman and a braggart, a bully prepared to bend and break the law in pursuit of his quarry, but he was also a man of high intelligence and remarkable courage, a supremely successful law enforcer and an intensely polarizing force in the confrontation between workers and bosses during the growth of America’s labor unions. To mine and railway owners, government officials and bank tellers in fear of armed robbery, he was a bulwark against lawlessness and union extremism. To mine workers, union members and labor leaders, he was a symbol of ruthless oppression, the hated hireling of the rich, an agent provocateur, a perjurer and a sneak. Hyperbole followed McParland everywhere. The Appeal to Reason, a pro-union newspaper, described him thus: “Were the world’s supply of emetic poured down the hot throat of hell, the ultimate imp of the last vile vomit would be an archangel in good standing compared with this feculent fiend.” Now that is balanced reporting. Locating the real James McParland amid the invective, acclaim and invention (including his own) is no easy task, and Beau Riffenburgh, author of “Shackleton’s Forgotten Expedition,” has made good use of the recently released Pinkerton archives to produce the fullest and fairest biography to date. Yet McParland continues to be an oddly mysterious character, obscured by his very notoriety. Riffenburgh deftly undermines the more extravagant claims made on behalf of the Molly Maguires, noting that many of their misdeeds were carried out as “responses to personal grievances” and “not as part of the larger class struggle.” McParland’s role in the prosecutions is deeply contentious. He was prepared to lie on the witness stand, and some of the confessions he claimed to have heard were too good to be true. Is it likely, Riffenburgh wonders, that “so many men involved in heinous crimes would have so lightly confessed to someone they had not known long” and “in such a way that no one else could hear the conversation”? The defense insisted that McParland actively encouraged crimes he then failed to prevent. McParland’s motivation was also obscure. Riffenburgh wanders into the realm of speculation in search of a moral impulse behind McParland’s campaign against the Molly Maguires, suggesting he “might even have seen it as an opportunity to altruistically help the Irish Catholic mining community.” There is little evidence to support this, and a great deal to suggest that he was guided by a sense of his own rectitude, as well as personal ambition, a taste for subterfuge and a determination to get a conviction, whatever that required. He believed, Riffenburgh reminds us, that “the end justifies the means” — the traditional rationale of brutal, driven men. The Molly Maguire trials made McParland famous, and infamous, and won him literary immortality. During a trans-­Atlantic crossing, Sir Arthur Conan Doyle fell into conversation with Allan Pinkerton’s son William, who told him about the case. In the Sherlock Holmes story “The Valley of Fear,” Conan Doyle duly created Birdy Edwards, alias John McMurdo, the detective who infiltrates the violent “Scowrers” of the Pennsylvania coalfields. Over the next 30 years, McParland investigated (or, more accurately, supervised others in investigating, and then took credit for) a string of high-level cases involving train robbery, swindling and the notorious Wild Bunch led by Butch Cassidy. His efforts to convict union leaders for the Steunenberg murder failed, in part because of the dubious way he had assembled the evidence, but the case only increased his celebrity. The “Great Detective” was created by a feverish press and McParland’s self-­mythologizing. He kept his feelings to himself. “We will never know for certain what he believed, what he felt, why he acted as he did,” Riffenburgh writes. It’s a candid admission, but one that inevitably leaves the reader unsatisfied. McParland was the prototype of a character that has become an adored part of America’s cultural landscape, the hard-boiled gumshoe, the lone sleuth in search of justice. He was the first private eye in the public eye, and yet he remains strangely private. Illustrated. 384 pp. Viking. $32.95.